Women Campaigners Would Enlist Laborers in Their Cause. Mrs. Ehrgott Makes First Speech From Tonneau of Auto Pendleton—Real Fight to Start at Later Date. Enlistment of laboring men in the cause of woman suffrage will be the object of leaders who are organizing the state in preparation for the November election, when the amendment to the constitution granting women the right to vote will come up for the consideration of the voters. Already considerable work has been done along this line. The Central Labor Council has long been on record as in favor of the enfranchisement of women. 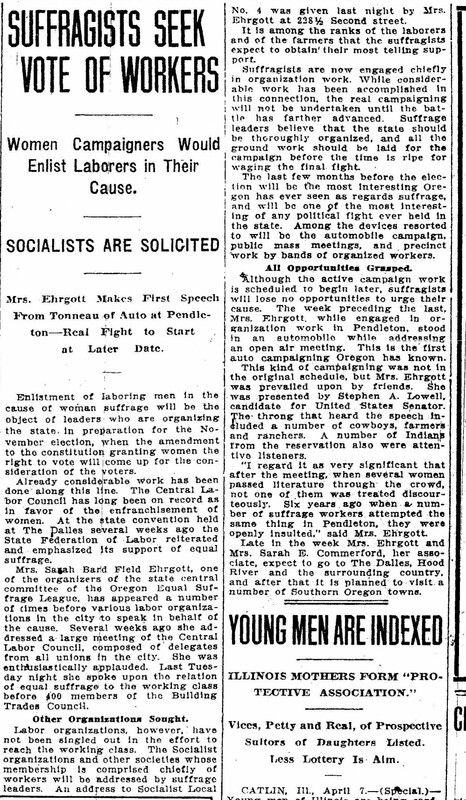 At the state convention held at The Dalles several weeks ago the State Federation of Labor reiterated and emphasized its support of equal suffrage. Mrs. Sarah Bard Field Ehrgott, one of the organizers of the state central committee of the Oregon Equal Suffrage League, has appeared a number of times before various labor organizations in the city to speak in behalf of the cause. Several weeks ago she addressed a large meeting of the Central Labor Council, composed of delegates from all unions in the city. She was enthusiastically applauded. Last Tuesday night she spoke upon the relation of equal suffrage to the working class before 400 members of the Building Trades Council. Labor organizations, however, have not been singled out in the effort to reach the working class. The Socialist organizations and other societies whose membership is comprised chiefly of workers will be addressed by suffrage leaders. An address to Socialist Local No. 4 was given last night by Mrs. Ehrgott at 228½ Second street. It is among the ranks of laborers and of the farmers that the suffragists expect to obtain their most telling support. Suffragists are now engaged chiefly in organization work. While considerable work has been accomplished in this connection, the real campaigning will not be undertaken until the battle has farther advanced. Suffrage leaders believe that the state should be thoroughly organized, and all the ground work should be laid for the campaign before the time is ripe for waging the final fight. The last few months before the election will be the most interesting Oregon has ever seen as regards suffrage, and will be one of the most interesting of any political fight ever held in the state. Among the devices resorted to will be the automobile campaign, public mass meetings, and precinct work by bands of organized workers. Although the active campaign work is scheduled to begin later, suffragists will lose no opportunities to urge their cause. The week preceding the last, Mrs. Ehrgott, while engaged in organization work in Pendleton, stood in an automobile while addressing an open air meeting. This is the first auto campaigning Oregon has known. This kind of campaigning was not in the original schedule, but Mrs. Ehrgott was prevailed upon by friends. She was presented by Stephen A. Lowell, candidate for United States Senator. The throng that heard the speech included a number of cowboys, farmers and ranchers. A number of Indians from the reservation also were attentive listeners. “I regard it as very significant that after the meeting, when several women passed literature through the crowd, not one of them was treated discourteously. Six years ago when a number of suffrage workers attempted the same thing in Pendleton, they were openly insulted,” said Mrs. Ehrgott. Late in the week Mrs. Ehrgott and Mrs. Sarah E. Commerford, her associate, expect to go to The Dalles, Hood River and the surrounding country, and after that it is planned to visit a number of Southern Oregon towns.